Chili is used in Asian cooking more than any western cuisines. I cut, dice, mince and blend them daily, and below is the collective experience I want to share with you. There are three types of chili regularly used for cooking in Asia (where I live)- the red chili, green chili, and the bird’s eye chili. Red chili is the most popular one among the three. It is used in all kinds of curry dishes, making the curry paste, chili paste, sambal and as a garnish. Green chili has a more precise use. It is for Thai green curry, making biryani rice, marinating meat for butter chicken and tandoori. The Chinese like to cut it into small rings and marinate it with vinegar as a condiment. Bird’s eye chili is the hottest among the three. It is about four to five centimeters long, come with both red and green species. You can use the uncut bird’s eye chili in Tomyam soup, chop it for Thai basil chicken, Kampong fried rice, or small pieces as a condiment. Hold the tip and remove the seeds with a spoon. The best way is to use a sharp knife. You can do this with the edge of the knife or a metal spoon. (I use the round measuring spoon). In practice, you might not want to remove all the seeds, as you want to retain some heat. The seeds are not the hottest part. The pith that attached to the seeds is. Unless you have a specific reason, e.g. use it as a garnish, you might consider just leave the seeds intact. Do you realize that the second bite is always hotter than the first? Some people believe that the pith produces more heat than the seeds. The inner part closest to the stem is the hottest, as the concentration of the component capsaicin is the highest. 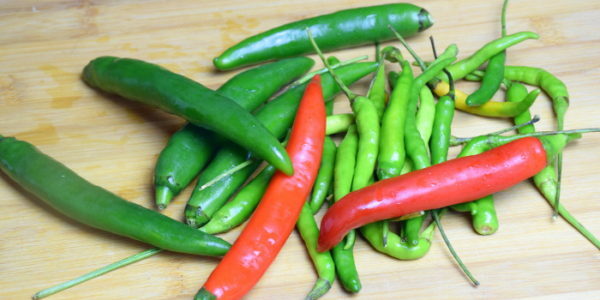 Capsaicin is the component that irritates your skin and make you feel burning. It is easier to cut with the skin side down. You can reduce the heat of the chili by removing the seeds. Just follow the steps as in the previous section. Place the chili skin side down on a clean, flat chopping board. Cut it lengthwise into thin strips. Turn it 90 degrees. Diced crosswise with the knife to the desired size. If you want to mince the chili, group the diced chili together, rock the knife back and forth, with one hand holding the handle and the other placing on the back of the knife. Mince to the desired fineness. From my experience, it is easy to cut with its skin side down. It is also simpler to cut by using a good chopping board with a flat surface. You can use a chef knife or paring knife to cut the chili. I have used different types of knives, and they are all working well. However, the knife must be sharp enough to slice through the skin. Making rings is the easiest way among all the methods. 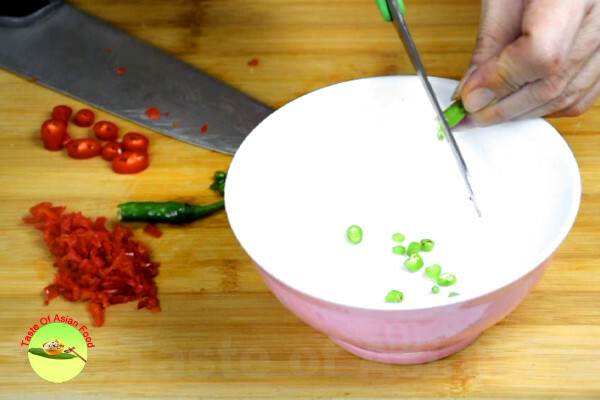 Place the chili on a chopping board and slice it into rings starting from the tip with a sharp knife. Shake off the seeds on the chopping board and pick up only the rings. 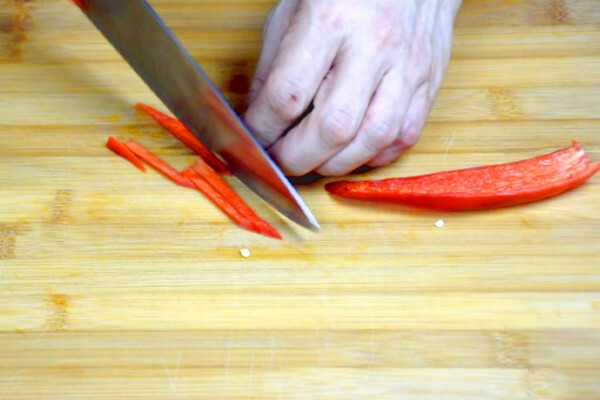 Kitchen shears and scissors are more efficient for cutting bird’s eye chilies than a knife. Hold the stem, start cutting from the tip (opposite side of the stem) above a bowl. The small rings will drop into the bowl. Shake the chili rings in the bowl to detach the seed. Pick up the rings and discard the seeds. The first plant in the world farmed domestically is believed to be chili peppers. Archaeologists have found 6000 years old chili in Peru and Mexico. 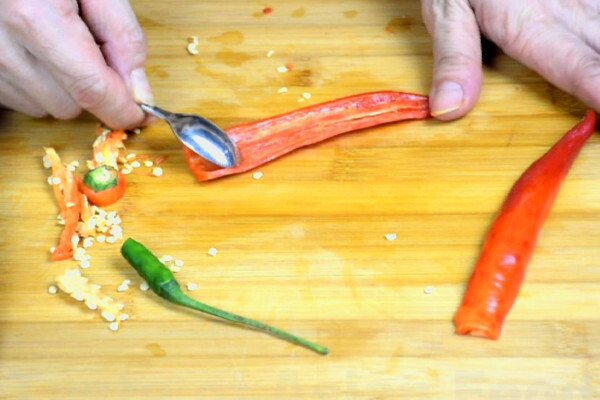 Cut bird’s eye chili with a pair of scissors. Some people are sensitive to capsaicin, the organic component that causes the tingly burning sensation on the skin. You can wear a pair of gloves when you work on it, but it is quite clumsy in practice. The heat comes from the capsaicin, which is concentrated at the pith and to a lesser extent, the seeds. 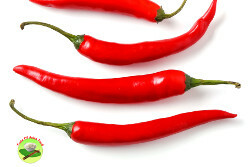 It will not irritate your skin as long as you do not touch the inner part of the chili. I cut plenty of chilies whenever cooking curry. The following steps work every time, and I never use gloves. Place a piece of old newspaper underneath the chopping board. The paper must be much larger than the chopping board. Hold the chili when you cut off the stem. Slice it into halves. Once it is cut open, be careful not to touch the seeds and the pith. Hold the tip (there is no seeds and pith at this part) and scrape off the pith and seeds with a spoon. Put the deseeded chilies aside. - Use the blade of the knife to push all the seeds and pith onto the old newspaper. -Clean the knife with the old newspaper. - Throw away the old newspaper along with the stems and seeds. - Drop the used chopping board and knife into the dishwasher or clean under running water. You do not need a pair of glove anymore after some practice. I have done that numerous times, and so you can. While capsaicin can be a fiercely irritable compound to human, birds are completely immune to it. That is why birds are primarily responsible for spreading the wild chili to different parts of the world, by consuming it and excreting the seeds. Chili flower as a garnish. Chili flower is an attractive garnish in Asian cuisine. Follow the following steps to make some to add a decorative touch to your meal. 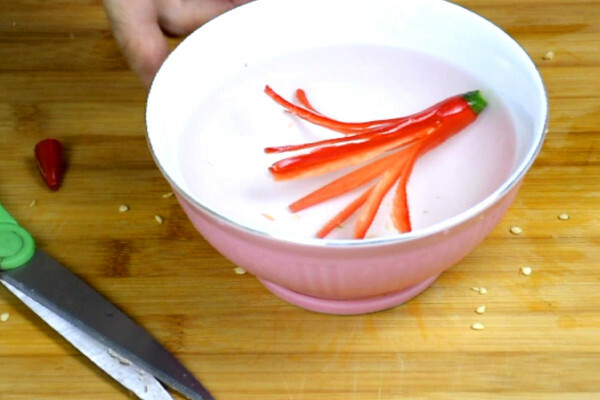 All you need are a piece of fresh chili, a bowl of ice water and a pair of pointy scissors. - Cut off the tip, about half centimeter length. - Snip it lengthwise and stop short about 1 centimeter from the stem. - Repeat the process by cutting lengthwise to create a few more strips of equal length. - Remove the seeds and pith with a spoon. Soak the chili in ice water for about twenty minutes. The strips will curl outwards slowly in the ice water to form the ‘petals’ of the flower. Remove it from the water if you want to use it immediately. Otherwise, it can be kept up to one day in the ice water for later use. What if you accidentally touch the seeds and pith, producing furious heat on your hands? Therefore, any methods that can neutralize the alkali oil and has oil dissolving property will work well to remove the irritant. Chili oil is more soluble in alcohol than water. Clean your hand with alcohol help to remove the oil. You can get alcohol or alcohol swabs at any pharmacies. Wash with dishwashing liquid, not hand soap. Dishwashing liquid has a much better oil dissolving properties than ordinary soup. Therefore, it is more effective to get rid of the oil. Chilies can stay fresh at room temperature for just a few days. However, it will stay fresh in the refrigerator up to two weeks. Wrap it in paper towels or old newspapers. Place it in a plastic bag or a container with cover. Do not freeze the fresh chilies as the texture will change after freezing. The frozen chilies will become mushy after defrost.